The children have returned to school. Days are getting shorter and evenings are cooler. Fall is in the air. Autumn conjures up images of wooly sweaters, crackling fires, football games, and tissue boxes as we head into flu season. It’s the time of year to consider getting your annual flu vaccine. This is also the same time of year that many myths and misconceptions about the flu vaccine begin to swirl around like the falling leaves. In the elderly especially, a flu vaccine can be a matter of life or death. We want to debunk some of the common myths about the flu vaccine and encourage everyone to speak to their physician to make an educated decision about their health. Myth #1: You need not get a flu shot this year because you had one last year. Truth: Getting an annual flu vaccine is necessary to fight the flu viruses that research shows will be most common in the upcoming season. According to the Center for Disease Control (CDC), they recommend getting the flu shot every year. For those over the age of 65, it is important to get an annual flu shot because this population is at high risk for complications. The flu vaccination is updated each year to handle the changing flu viruses that are likely to hit in a season. Myth #2: The number of deaths from the flu are exaggerated. Truth: Particularly for the elderly, the flu is a serious disease that causes hospitalizations and thousands of deaths in the U.S. every year. In reality, it is difficult to put an exact number on the deaths due to influenza every year because often people die from the complications associated with the flu. These complications will be stated as the primary cause of death on the death certificate. But the CDC estimates that of the deaths related to influenza that 71-85% occur in adults 65 years or older and between 54-70% of those hospitalized are in that same age group. 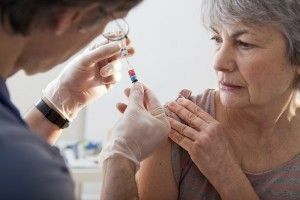 Influenza can have deadly consequences for the elderly whose decreased immune system cannot handle the illness, and they often suffer complications. Myth #3: The flu vaccine will make you sick. Truth: The flu vaccine will not give you the flu. This is a common misconception of the flu vaccine. The flu can incubate for 2-5 days in your system. If you get sick shortly after getting the flu shot, most likely you were infected with the flu at the time of your vaccination. Some may react to the side effects of the shot as your immune system ramps up to produce antibodies against the flu strains. These side effects may include headaches, low fever, or nausea. Myth #4: The flu vaccine will make it easier for me to catch pneumonia. Truth: Getting the flu vaccine will reduce your risk of pneumonia and other infectious diseases. This myth makes little sense. If you catch the flu, your immune system will weaken while you are ill. During your run of influenza (which can last anywhere from three to six days), you are more susceptible to catching a secondary illness. Pneumonia is one of the most common complications of the flu. The flu vaccine will reduce your risk of getting pneumonia, the leading cause of death for those who pass away from influenza complications. Myth #5: The flu shot can cause Alzheimer’s. Truth: There is no link between the flu vaccine and Alzheimer’s. In fact, this myth has been debunked for over a decade by the Alzheimer’s Association. According to their website, several mainstream studies link flu shots and other vaccines to a reduced risk of Alzheimer’s disease and overall better health. As with all matters of your health and the health of your loved ones, we suggest that you consult with your physician about the benefits of getting a flu shot this season. Research the facts about the flu vaccine to make an educated decision on what is best for you and your family.